So much eloquent prose and commentary has already been written and spoken about the teenagers from Margery Stoneham Douglas High School here in Florida. How they have clearly captured the high moral ground in the debate about assault weapons in America. How they have a steely, non-smiling, eyes into the camera, clarity and purpose. How they make the reality and truth about the gun debate so simple- the truth usually is- by asking very direct questions and understanding that this time it is different because of them. They literally make all the politicians look like purveyors of verbose obfuscation. Yet the double-talking politicians have been pulled by the student’s gravitational pull to change. During the CNN town hall two things happened that have already changed the political landscape in the state of Florida. Senator Rubio could not answer a yes or no question about whether he would continue to take NRA money. While he did show up, his answers to student and parent questions were so stereotypical politician speak that it was laughable. As a commentator later said on TV said, it was like a Charlie Brown TV special where the kids could be understood, but the parents were always ‘wah-wah-wah-wah’. The second thing that happened was that popular Senator Nelson, a Democrat running for re-election, stood strongly with the need to change gun laws. This triggered the change in position of a steadfast supporter of the NRA, Governor Scott, to support two significant changes to the NRA positions. Why? Scott has served two terms, cannot run again and is planning on running for Senate against Nelson. The older generations in political power immediately assumed that, as it always has in the past, the flair-up of the issue because of a mass murder by automatic weapon would soon fade. Nope. The governor of the third largest state, one with lax gun laws has changed his NRA aligned position. Corporations that had relationships with the NRA have severed them; and very publicly. So, a group of teenagers who had just experienced something no one at any age should experience, has already triggered more change in two weeks than any political group has in recent memory on this topic. It might well be the beginning of a passing to a new generation in America. As one of the students so succinctly put it: we will outlive all the old elected officials. As a futurist, one of the trends I have spoken about for a decade is that the Millennials and the Digital Native generations – born since 1981- will become the majority of the workplace in America between 2020-2024. As I say to business owners and companies, these two generations are your future employees and customers. Are you prepared? What changes will you have to make? [a subject for a future column]. 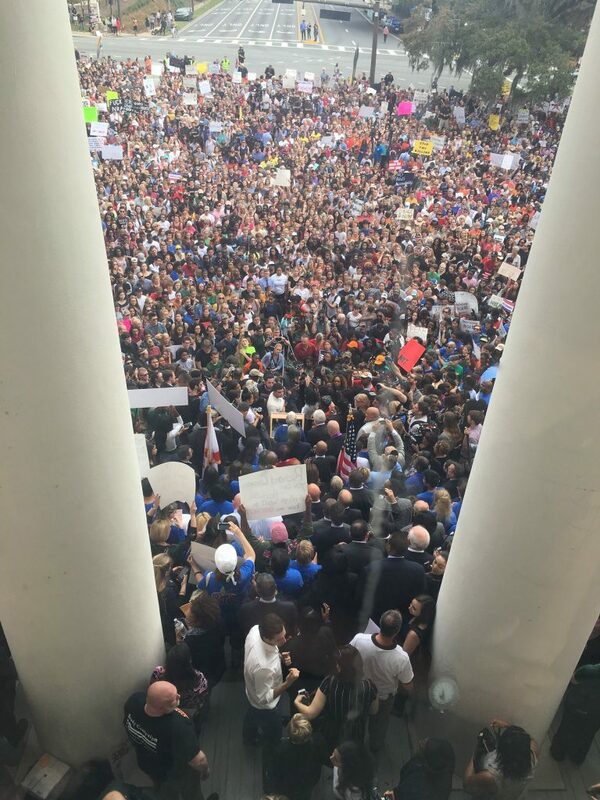 If these two generations – the high school students at Stoneham Douglas are Digital Natives- increase their level of political activism and voting over past young generations, then by the 2024 elections, they will be the dominant force of electoral politics in America. Could it be that, looking at the magnificent, pure and brutally honest Stoneham Douglas students we are seeing the face of US politics in the 2020s? I think so. This profoundly shifts one’s perception. Rather than a country frustrated with politicians’ inability to both get something done and represent the citizens, wondering if anything will change, we now know that, within a few years it will. The tide has changed. The students have said “Never Again!”. Well, given the number of automatic weapons in America and our unfortunate propensity for “copycat” crimes, there will be another mass murder in a school or supposedly safe place. When that happens, the NRA, now pushed back on their heels a bit, will have to make a retreat, as the primary goal of politicians is to get re-elected and the electorate, led by the young is rising up for stricter gun laws. One thing that will become clear in the 2018 elections is that many politicians running for office will go out of their way to NOT accept NRA contributions. When an all-powerful lobby starts to become toxic to politicians, their influence will wane. They already know it. 2018 is the 50-year anniversary of 1968. 1968 was one of the most disruptive years in our country’s history. What were some of the dominant images from that year? Students marching in the streets, demanding change, calling out ‘old’ politicians and old models. One result was that by the early 1970s, the behind closed-door, smoke-filled rooms started to give way to the primary process, which has been dominant ever since. Of course, now it needs some updating. At that time, I did not see that high school students would be leading the way. And the young are leading us to when they become the majority in the next 5-7 years.